The best of city living with the World’s Fair Park at your doorstep. Conveniently situated in the historic Chocolate Factory between vibrant Downtown and the University of Tennessee. Enjoy spectacular views of the Worlds’s Fair Park and Knoxville’s iconic Sunsphere from this stylish top-floor corner residence. This remarkable loft, which is available fully-furnished, features include a generous balcony, beautiful hardwood floors, exposed brick and wooden beams, quartz countertops and stainless appliances. Building amenities include a fitness room and community room. Square footage provided by Courthouse Retrieval System and is an estimate only. Buyer to verify size. Location: From I-40 take the Henley Street exit toward Downtown. From Henley Street, take an immediate right onto Clinch Avenue. Pass the Knoxville Convention Center on the left and the Holiday Inn on the right. Cross over Worldâ€™s Fair Park. The Candy Factory Lofts are located in Chocolate Factory building on right, adjacent to the Knoxville Museum of Art. There is a trolley stop conveniently located in front of the building. 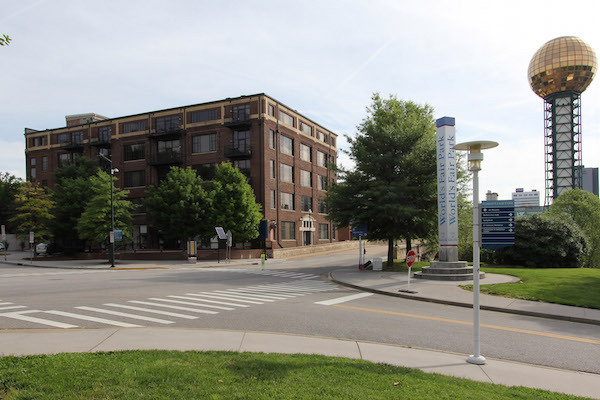 Metered parking is available on the street and in the public Fort Kid parking lot across from the Knoxville Museum of Art (approx. $150/year for Downtown residents).